To measure the intensity of the fire now spreading through Liverpool, imagine Mohamed Salah in the fifteenth minute with his team already leading and kicking towards the Anfield Road end. On this occasion, though, he was scampering diagonally across the pitch and towards the Kop as he chased Otavio, the Brazilian midfielder. Fighting for territory and winning a free-kick, Liverpudlians related to the desperation of this moment and even the oldies closest to Salah jumped from their seats in the paddock of the main stand and celebrated like they had witnessed one of his goals. Salah had terrorised Alex Telles, an experienced left-back who has spent time at Galatasaray and Internazionale already in a career which is soon expected to bring him to England or take him to Spain. Salah's shooting in the warm-up was exemplary, the Kop gasping at the magnificence of his accuracy. Though this did not translate into the course of the game that followed, his threat was at a red warning level for Porto's entire defence who struggled to deal with him. If Salah is finding form and influence at just the right time for Liverpool then so is Naby Keita and Jordan Henderson. Each scored at Southampton on Friday night and both were hugely impressive here. After just four minutes a feeling of dread temporarily took hold of this Porto team, as Keita scored his second Liverpool goal just days after scoring his first. You can see there is a player in the Guinean, the grace with which he carries the ball as well as his technique in passing it. On the whole, he has disappointed in his first season but that will be forgotten if he contributes towards a trophy at the end of it by continuing in this vein. 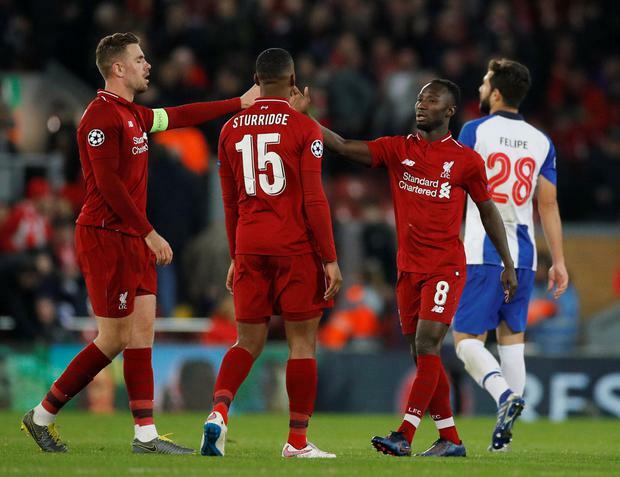 Porto may have been desperate to put right the wrongs of last season when Liverpool trounced them to the degree they might as well have forfeited the second leg at Anfield. Yet an image as early as the 27th minute illustrated the position they were already in. One short sleeved replica shirt-wearing supporter was stood in the away end with his hands on his hips, staring blankly at his friends. From the technical area, Porto's manager Sergio Conceicao backed into the dugout behind and with his hands in his pockets fell into a seat, blowing heavily into his cheeks as if he'd been chasing Liverpool's midfield around himself. It was 2-0 already by then. This goal was scored by Roberto Firmino and supplied by Trent Alexander-Arnold but the chance opened up because of Henderson's pass, which rendered irrelevant the efforts of Telles and the Real Madrid bound Eder Militao. Henderson has enjoyed more freedom operating higher up the pitch in Liverpool's last two games, though he was only introduced at Southampton mid-way through the second half. He played a similar role when Liverpool won at Wolves earlier in the season and was magnificent that night. It does make you wonder why Klopp has not tried him there more often because his running and aggression helps Liverpool's attackers, who have needed more support from midfield since Alex Oxlade-Chamberlain fell to his knees and was ruled out for a year. Henderson would not win a popularity contest amongst Liverpool's captains through history. Like Keita, though, maybe what has gone before will be forgotten if he lifts silverware at some point in the next eight weeks. 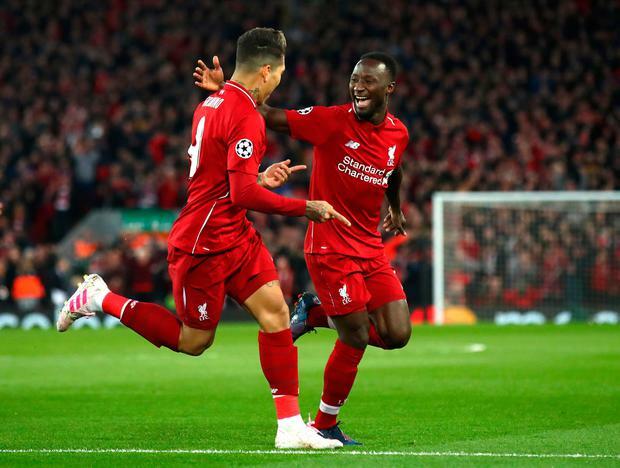 Seldom, indeed, has a Champions League quarter-final been the second most significant game of the week for a team featuring in the competition for just the second time in five seasons but that is the case for this Liverpool. For the first time in almost two months, this was a game where anything but a victory would not be met with an end-of-the-world sort of feeling. Since the Champions League round of 16 first leg tie at Anfield with Bayern Munich in mid-February, Manchester City have overtaken Liverpool at the summit of the Premier League table but they have since been relentless in their pursuit of the champions, producing a five-match winning run which has involved a memorable night in Bavaria as well as a maximum 12 points from league fixtures despite in-game problems that have invited sharp mental trials. In Portugal next week, the challenge will arrive if their opponent scores first yet Liverpool's threat is on the counter attack and Porto will remember from last season what happens when they leave the door ajar even slightly. Phil Blanche Virgil Van Dijk says Liverpool need a collective effort to stop Lionel Messi in their Champions League showdown with Barcelona.